"Efficiency, equity, and Adequacy: Financial Reform of China’s Compulso" by Zeng Manchao, Ding Xiaohao et al. Danke Li is a contributing author, “家庭教育决策在中国农村教育社会性别不平等中的含义” (Household Decisions on Education and Its Implications for Gender Inequality in Rural China), pp. 131-149 (in Chinese). 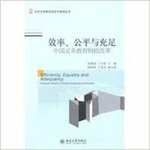 Manchao, Zeng; Xiaohao, Ding; and Li, Danke K., "Efficiency, equity, and Adequacy: Financial Reform of China’s Compulsory Education" (2010). History Faculty Book Gallery. 54.